The Kolibris curling club was founded on 15. 4. 1996. 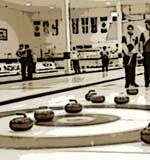 It was the idea of the best curlers at that time (D. Šik, M. Polívka, K. Hradec, P. Menšík a D. Havlena). These players had been part of the Czech national team that had played so well at the 1995 European Championships in Grindelwald (Switzerland). Before the start of the European Championships we travelled and played throughout Europe enabling us to gain a lot of experience. We acquired our curling knowledge and skills from the Swedish trainer, Olle Brudsten, who as trainer led our team to the 1995 European Championships. He passed on to us not only his experience in how to found a club but primarily in how to get it on the right track to being the most successful club in the Czech Republic. Our club is one of the two largest which are members of the Czech Curling Association (ČSC) and we have put together several excellent junior and senior teams. At present, our club has four junior teams, nine senior teams and the largest number of active club trainers in the entire Czech Curling Association. Our trainers know how to get their teams to achieve their targets and to become more successful each year on the international stage. Our club has recorded successes at tournaments both in the Czech Republic and abroad. We have also been successful in representing the Czech Republic (at the European Championships). Our men’s teams have fought their way through at competitions organised by ČSC to represent their country and several times have achieved good positions at the European Championships. Our teams represented the Czech Republic at the European Championships in 1997 and 1998 where for the first time in the Czech national team’s history they won a place in group A. No other men’s team has since been able to repeat this success. Our women’s team competed for the first time at the European Championships in 2000 in Obersdorf. Our efforts in working with juniors has also borne fruit. In 1997 – 2000, 2003 and 2004 our junior women successfully represented the Czech Republic at the Junior World Championships. In group B at the last Junior World Championships Czech juniors, both men and women, brought back bronze medals. The entire junior women’s team was from the Kolibris club and one of our members was in the junior men’s team. The year 2001 was a very important one for the club’s development and the presentation of its activities. Thanks to the club’s strong management it was possible to organise the first annual Kolibris CUP, in which more than 16 teams from the Czech Republic and traditional curling nations such as Switzerland, Scotland and Norway took part. In recent years they have also been joined by teams from Germany. The Kolibris CUP has really found its place among the other large tournaments in Europe and has made a name for itself among curlers from all over Europe.